Flipped classroom 102: What a performance! What’s it like to deliver lectures online? This year we pre-record 11 one hour lectures. Eight of these were recorded via HD video on a smartphone — roughly one hour in length divided into 10-20 minute segments. These were recorded in a range of locations, some out doors, and with some relevant film excerpts from YouTube and other sources inserted to liven things up. Two lectures were recorded using Panopto screen capture software, that allows the viewer to flip between a video of the lecturer and a content window showing Powerpoint slides, web browsing episodes, etc. One presentation used Quicktime screen capture with voice only. So we explored a range of presentation media. None of this involved studio recording, professional producers or editors, or specially equipped lecture capture teaching rooms. We were keen that the digital lecture delivery continued the practice of lecturer independence and self sufficiency. Who wants to call in learning technology support every time you have to give a lecture! Supplementary to the video lecture content we included links to reading lists, notes, and short blog-style quizzes on the lecture content. All of the course material was made available online using our university’s VLE (virtual learning environment). The material was prepared throughout the semester, with much of the lecture content delivered a week or so before it was needed. There was also an opportunity here to adjust content according to informal feedback from students. As this was a course in digital media we thought it appropriate to make digital output the focus of assessed student work. In the previous year we required students to submit a video essay, i.e. a carefully scripted 6 minute video of the student delivering on a digital media topic, selected from a range of suggested essay topics. In the end we felt the video added little to the essay format, and markers found it easier and quicker to focus on just the written script. But skills in video presentation seem important in the media rich world of the online 21st century professional. See We are all entertainers. So we alighted on the idea of a video interview: pick a relevant topic, and select a fellow student or outsider and interview them about your topic. As a lead in to this exercise we asked students to submit a short essay describing their topic, followed by a list of carefully worded questions. The teaching staff then provided feedback on the content and the questions in plenty of time for the students to set about recording their interviews. A further submission involved a case study of the student’s choosing, typically desk-based research into a high profile case of digital media development, use, or controversy. The course is called Media and Culture, and the lectures titles covered week by week are as follows: post digital cultures, play and creativity, emotion and the body, voice and text, metaphor, music and sound, digital society, artificial intelligence, virtual reality and techno-utopias, ethics, audience engagement and entertainment. We’ve been teaching the course with an emphasis on the digital for over 15 years now. The course content requires continual updating as the technology changes and the relationships between media channels reconfigure. We emphasise design, and the practices of making, using, incorporating and critiquing technologies and the cultures in which they are developed and promoted. When we started, digital media was a niche subject. Now it’s under discussion everyday on television and radio news and magazine programmes reflecting awareness in the community at large. The effects of digital media are part of everyday experience for most of us. For example, though its precursors were in evidence, ubiquitous smartphone access to social media didn’t exist in the 1990s. Some themes that were only marginal in the 1990s have gained prominence as sources of contemporary concern: e.g. Internet addiction, online grooming, isolation, digitally informed political revolutions, mass migrations, and even fears that one day machines will take over the world. The course aims to tease out new and long-standing issues while at the same time staying grounded to its original motivation in the arena of design. The course supports students who are actively engaged in the professional business of using and developing digital media applications. Those of us who contribute to the course have long thought of students as co-contributors. After all digital natives or their older siblings are now populating our classes. So the student cohort itself is an excellent learning resource. Two other factors contributed to our motivation to move towards the flipped classroom model of teaching, both resulting from the globalisation of educational delivery. We received funding to provide an online distance learning (ODL) variant of our courses, and this year recruited 5 students based in the USA, the Middle East and The Philippines. They enrolled in the Media and Culture course as ODL students, and the recorded lectures were the main means for them to receive the course content. The resident student cohort also grew from about 50 in the previous year to over 100 this year, made up of many students whose first language is not English. In previous years I would record my lectures as audio podcasts, and many students would report that they appreciated the opportunity to re-play the lectures in their own time and at their own pace. So we had some support for the view that recorded lectures aid comprehension. What happens next? Next week I’ll explain what happened during the time normally allocated to the face-to-face lecture … then an evaluation. The first image is of Katie Dobberstein (left) being interviewed. 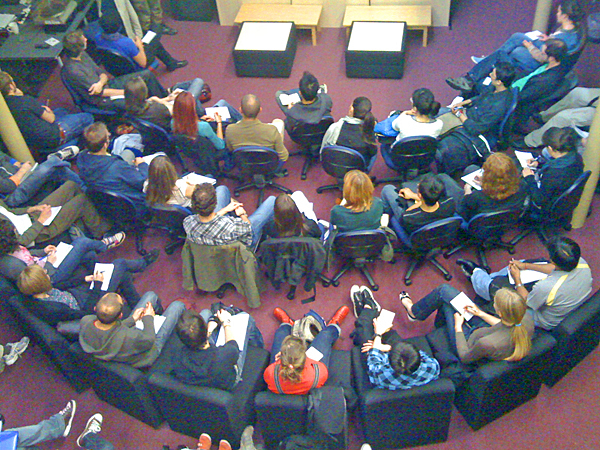 The second is of a lecture in the atrium, Alison House (not this course).